On Friday evening towards the end of the Easter Rising, there was one further horrific incident that convined Padraic Pearse that surrender, and quickly, was the only course open to the rebels. There was a chaotic retreat from the burning GPO, with surrounding streets ablaze, and British soldiers firing from barricades. The streets around the centre of Dublin were death traps. 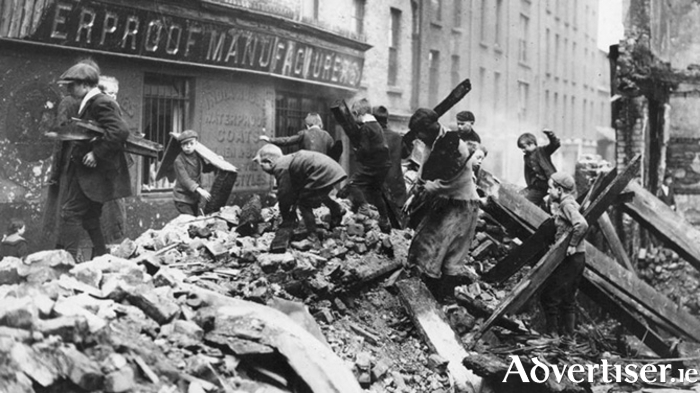 Yet even while artillery shells ripped through buildings, and exploded into shards of metal, a group of men and two women, some carrying a wounded man on a stretcher, ran towards Moore Street, which was out of the immediate battle zone. The men had tunnelled through the walls of neighboring buildings from the GPO, till they reached a place where they believed were out of immediate danger. Most of the doors at Henry Place, just off Moore Street, were shut tight. Members of the group banged on the doors, until they arrived at number 10 where the McKane family, all 11 of them, lived. During that fateful week, the McKanes, who lived near the heart of the battle, had huddled together in their tiny rooms, or crouched under their beds, saying the rosary. They had witnessed the shooting of a looter whose body was unceremoniously flung onto a barricade, but what followed was almost beyond belief. When banging on the door brought no answer, one of the men outside raised his rifle and attempted to shoot out the lock. But at that very moment Thomas McKane was reaching to unlock the door from the inside, while close behind him stood his 15-year-old daughter, Bridget. The bullet passed through the father’s body and right lung, and hit Bridget directly on the forehead killing her instantly. Horror and hysteria erupted among the family. Immediately the fugitives from the battle, rushed into their home and small kitchen. Among them were Padraic Pearse, Willie Pearse, Joseph Plunkett, Sean McDermott, Tom Clarke, Miss Grennan, Elizabeth O’Farrell, and men carrying James Connolly with a shattered ankle. Michael Collins and a young Seán Lemass remained outside in the lane commanding material for makeshift barricades. In a unique piece of research, broadcaster Joe Duffy, told the recent Autumn Gathering in Gort, Co Galway, that in Easter Week 1916, the world was already in turmoil: countless thousands were dying in horrendous conditions on the Western Front as the war raged into its third calendar year. Dublin was full of newly widowed and distressed women. It was also the most dangerous place in the world for young people. Forty children aged 16 and under died as a result of the Rising, which broke out at noon on Easter Monday. For a 100 years, the deaths of these children have been forgotten. In many cases they were not even recorded. The children, many of whom were attracted to the the sound of gunfire, and the excitement of it all, ran from their tenements to see the action. There were opportunities for looting as shops were abandoned or destroyed by fires. Oh! I have roamed in many lands, /And many friends I’ve met /Not one fair scene or kindly smile /Can this fond heart forget. Margaret McKane, hysterical at the killings of her daughter and wounding of her husband, and the invasion of all these people, pushed passed them, and ran around into Moore Lane towards the British barricades, waving a white sheet over her head. NOTES: Children of the Rising - The untold story of the young lives lost during Easter 1916, by Joe Duffy published by Hachette Books Ireland, on sale €25.